Modern C++ stresses the use of RAII objects to manage resources. One of the easiest ways is just to start using unique_ptr across your code. Let’s see how we can leverage this smart pointer type. I’ve come up with 5 (or more?) reasons where unique_ptr shines. One of my favourite features of modern C++ is smart pointers. They are maybe not magic bullets that solve all resource management problems. Still, they play a significant role in enforcing safety. By using them, you can avoid memory leaks, access violations errors and be sure the object clean up is done right. While shared_ptr and weak_ptr are more complex, unique_ptr seems to be a perfect replacement for owning raw pointers. Not to mention is the fact that this pointer type is mostly a compile time “wrapper” and it cost almost nothing in the runtime. I know we’re talking about memory allocations, pointers, etc, etc… but at the beginning, I’d like to make a little remark. Sometimes using the heap is necessary, for example when your object needs to live longer than the current scope, or when you don’t know the exact size of the object (it needs to be computed in the runtime), or when your object is large. Still, think about the stack… maybe your object can be put there? Often, I’ve seen that an object is allocated on the heap, while it could be safely placed on the stack. The default stack size is around 1MB in MSVC (platform specific), that included memory for the call stack, params, etc…. but if your object is not super large and you’re not doing any deep recursions, it should be good enough. Also remember that containers, like vector, list, or even string will use heap anyway - they will take some space on the stack (like for small buffer optimization, or small string optimization), but they will allocate a chunk for the elements on the free store. Let’s move to the first point now. Such pointers lurk from their caves and see a chance to cause bugs in the system! With C++11 auto_ptr got deprecated and in C++17 it’s removed from the standard. So we “got” 6 years to abandon and refactor old code. Notice that it’s an error, not a warning. So what should you use instead? Of course, it’s the hero of our story: unique_ptr! What happens after doSomething() returns and we want to access myTest->m_value? In other words: auto_ptr is limited - mostly by not having move semantics supported at the time it was introduced. It’s also not reference counted (as shared pointers), so its use is somewhat cumbersome. And here’s the link to clang: clang-tidy - modernize-replace-auto-ptr — Extra Clang Tools. The pointer returned by new should belong to a resource handle (that can call delete). If the pointer returned by new is assigned to a plain/naked pointer, the object can be leaked. So… in other words: one of the parts of modern C++ is to avoid using raw new and delete. Instead, we should wrap allocated memory into RAII objects. You need to remember to release the memory. It’s easy when it’s inside a little function… but for larger scopes it gets tricky. Moreover, you might need to interleave with other resources. Naked pointers doesn’t show whose the real owner of a resource. Whenever you see new try to replace it with a unique_ptr and make_unique. What can you deduce from the statement above? In modern C++ we head towards using raw pointers as a way to observe things, but the owners are in the form of smart pointers (or other RAII types). Still, especially in legacy code, you cannot be sure what a raw pointer means. Is it for observation, or it’s an owning pointer? The only way we had to express who should release the memory was through some guidelines or comments. But the compiler wouldn’t help in case of a bug and a leak. Now, the ownership is inside pObj, and it’s released when pObj goes out of scope. Having better control over the ownership of the object is also handy when you want to pass resources to other functions. Sometimes, when you want to “observe” an object it’s enough to pass a raw pointer or a reference (const reference?) - use .get() from unique pointer to get the raw pointer, or *ptr to get the reference. There are also functions that require full ownership, they are called “sink functions”. In order to pass unique pointer to such function you need to use std::move. I wrote about Sink functions a few months ago: Modernize: Sink Functions. Every time you have to allocate an object on the free store, it’s useful to wrap it intounique_ptr. Do you see how much effort needed to clean up the memory correctly? And it’s such a simple code - in real-life resource management code might be much more complex. Moreover, as suggested by KrzaQ in comments, if process() throws, then we'll get a leak, as even our manually crafted deletions won't save us. It looks almost like if the pointers were allocated on the stack. Remark: the examples used memory allocated on the heap… but think if such objects can be allocated on the stack (see my 0th point). Not only it’s more straightforward but usually faster. Heap might be useful for huge objects (that wouldn’t fit into the stack space). “Pointer to implementation” - “pimpl” is a conventional technique to reduce compile time dependencies. Briefly, it hides all (or some) details of the class implementation with some other type (that is only forward declared). Such technique allows changing the implementation without the need to recompile client code. In the above example NetworkManager has a private implementation - NetManImpl which is hidden from the client code (main()). NetManImpl is implemented solely in a cpp file, so any changes to that class won’t cause the need to recompile client code - cpp_pimpl_client.cpp. While this approach might sound like a lot of redundancy and redirection (see implementations of Connect or Disconnect methods that just redirects the calls) it makes modules physically independent. 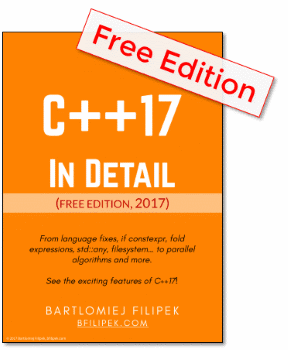 You can read more @Fluent C++: How to implement the pimpl idiom by using unique_ptr. By default, unique pointer uses delete (or delete) to free the allocated memory. This mechanism is good enough in probably like 99% of cases, but if you like, you might alter this behaviour and provide a custom deleter. If get() == nullptr there are no effects. Otherwise, the owned object is destroyed via get_deleter()(get()). Requires that get_deleter()(get()) does not throw exceptions. In other words, the deleter is called when the managed pointer is not null. Also, as deleter is part of the type of the unique pointer and may contribute to its size (if that’s a function pointer then it will take some space, if it’s only a stateless functor, then not). Download a free copy of my C++ Smart Pointers Ref Card! With this list, I’ve shown how this type of smart pointers leads to memory safety, code clarity, expressiveness and even much shorter code. Do you have any cool examples how you used unique_ptr? Share your stories and observations.